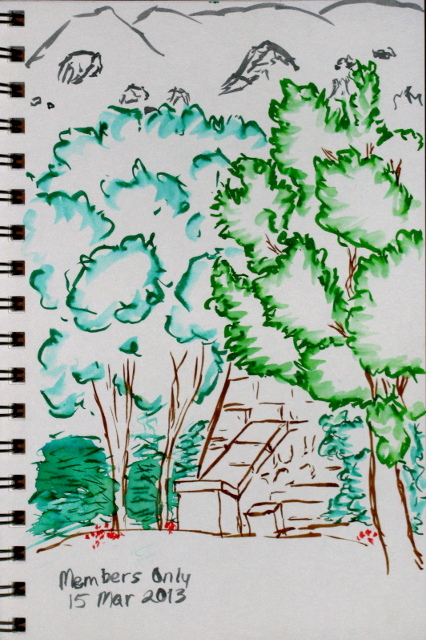 Sketching in watercolor at Shoreline Park. Some days the mountains are more attractive to the eye than the sea. 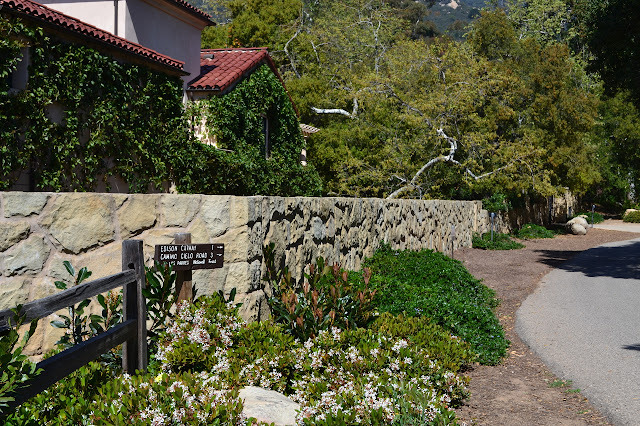 The current entry point to the old Montecito Hot Springs Club. 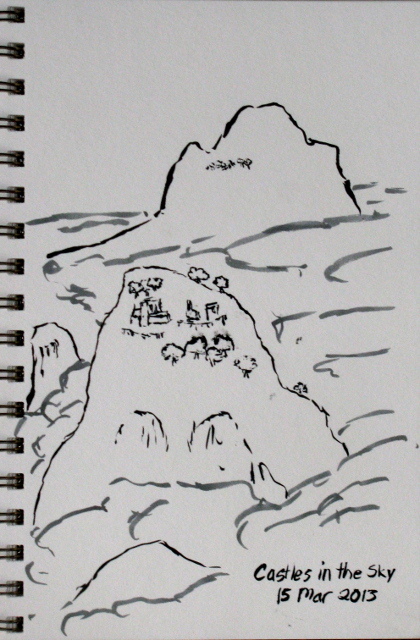 A bit of an attempt at fantasy from the reality of fog shrouded hills. 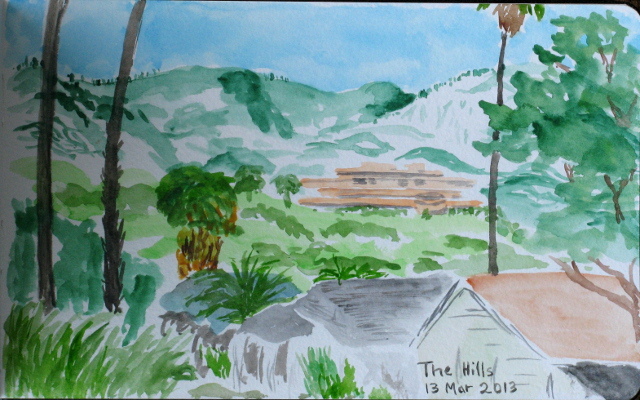 Additionally, there were watercolors painted at Forbush Flat on an overnight. I watched far too much of the moon's arc across the sky but somehow woke up refreshed anyway. A little bit of breakfast and drying out the bivy that seems to have been able to breath sufficiently in the Sierras but not in the Santa Ynez and other Los Padres mountain ranges got me started on my day. The wispy clouds were replaced by puffy affairs as the chance of rain climbed from minute to tiny. I settled into some more painting. 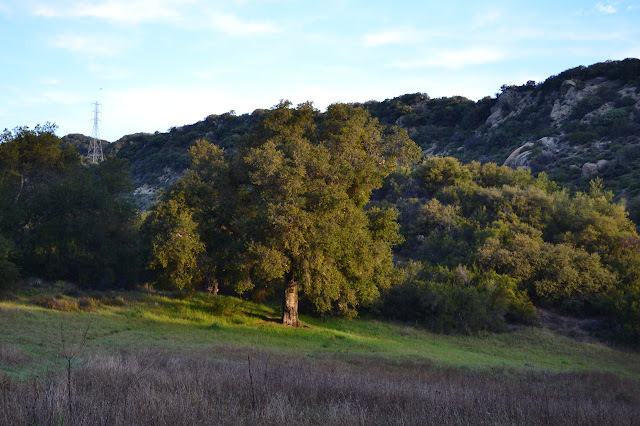 The large oak tree seems to be the first thing to get the sun in this part of the meadow. I have put together a backpacking quilt to replace my sleeping bag that refuses to be warm enough when the water starts to freeze and so need a place to test it. Where that can be now that it's properly spring, I'm not sure. Of nearby places, Forbush occurs to me simply because I've crossed a bit of frost on the trail close above it in the late morning. I believe the water there is reliable and maybe the fruit trees are blooming. It did occur to me that going to a place hoping for freezing nighttime temperatures and blooming fruit trees may be mutually exclusive goals. As a testament to which I thought would probably lose, I couldn't actually bring myself to throw in anything other than my jacket and gloves to ward off the evening cool. I didn't even really notice as I sorted the long johns and fleece into the unneeded pile. A minute chance of rain did get me to throw in the rain gear, but that was probably extreme hope that I have to use it rather than any expectation. Packed up, I made the short trip up Gibraltar, which has happily been repaved at the top, and over to the first water tank east along Camino Cielo. I found quite a few cars were already there. Whatever their reasons, it was unlikely to be the south view which was poor due to light fog. The view to the north, though, was crisp and stunning. Up on Cold Spring Saddle, the view the the south was a visible but grey. To the north it is bounded by the higher mountains and curve of the earth. The trail is cut into the side on the left. Spring is continuing to display an ample number of flowers. Maybe not so dense as some years, but certainly varied. Big, showy bush poppies and large patches of nightshade are the first flowers I notice. I quickly come to a bench set a half mile down this trail long ago in a cool drainage. The trough next to it is dry, but thick stalks nearby hint at the later coming of Humboldt lilies. Peas and clematis and paintbrush make a showing when the trail climbs from the drainage. 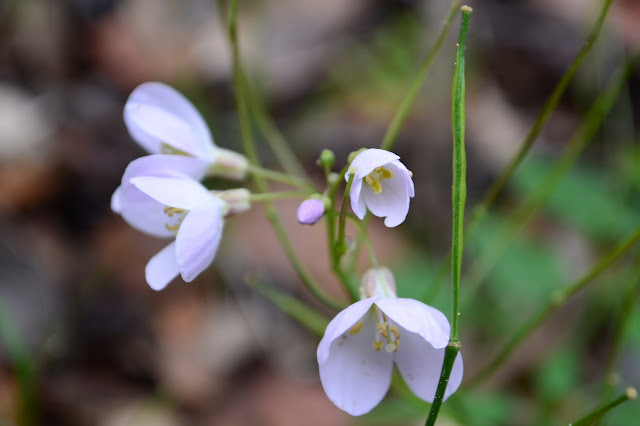 In among the larger flowers, there are also quite a few tiny little things. 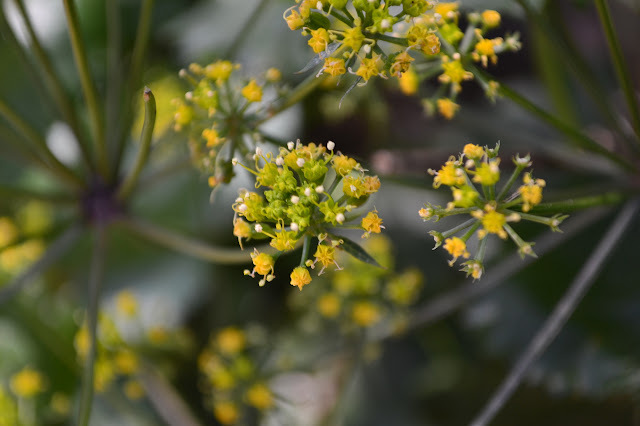 Sticking out on big green stalks that divide a few times into a burst, there are these tiny yellow flowers. 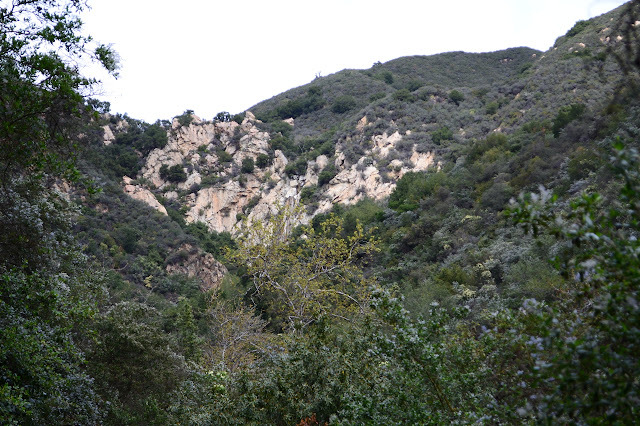 Hot Springs Canyon has been a private parcel of land where we were not, strictly speaking, allowed to visit. The land has hosted a hotel and clubs that utilized the supposedly healing waters that well up hot and stinky from the ground. 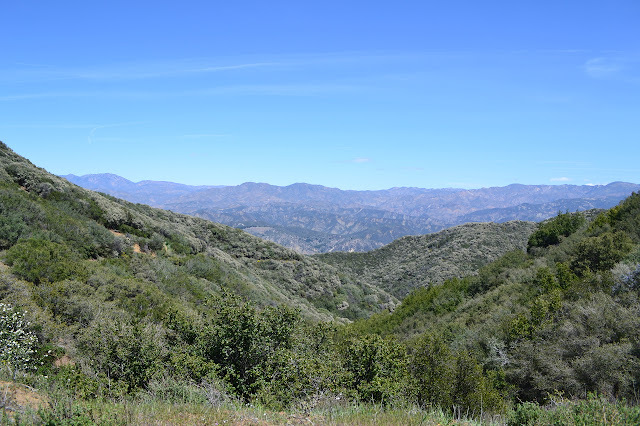 However, late last March, the Land Trust for Santa Barbara County picked it up with the intention of passing it on to the Los Padres National Forest which surrounds it. Now the public may access the land under all the usual rules for parks in the front country while the details of the transfer are still being worked out. 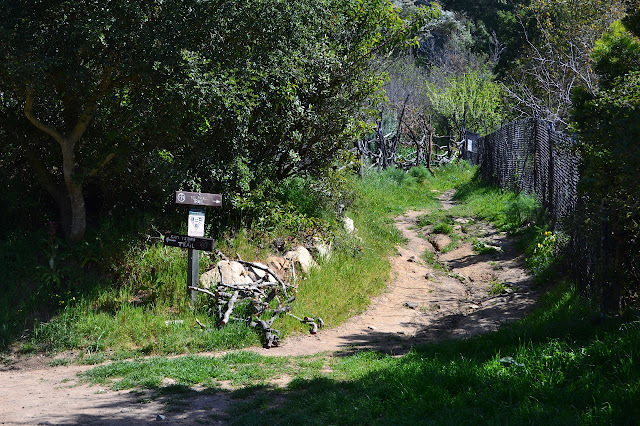 I chose an approach to the canyon starting off at nearby San Ysidro although it does have its own trail head. This route offers a nice loop and a couple extra little hikes at the end if I'm feeling I haven't hiked far enough yet. I found a parking spot and started up the well marked trail along the property lines. Traveling along the side of Park Lane to get to the mountains. The dirt gets quite narrow here, but there is no need to hit pavement at any point along this trail. The first of possible diversions along this trail is the Old Pueblo Trail. It was feeling like time to revisit Tangerine Falls and the rain the night before was, at times, quite heavy. With the last of the storm's rain still to fall, I headed for the Cold Spring trail head to see what I could see. Even as dry as it has been this winter, with the land sucking up any water that falls on it, I was hopeful that the waterfall would be impressive the day after a night of heavy rain. I parked the car in the lot with the rest of the people lazier about finding a parking spot than walking a hundred yards, skipped the first trail head that climbs missing the stream entirely, and started up the second, signed, trail head. 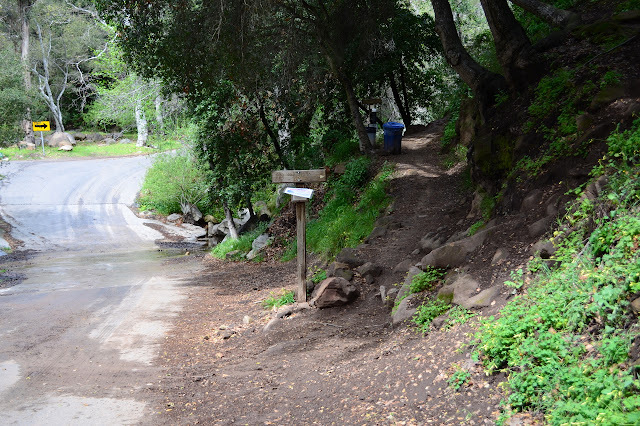 Hikers may start on the west side of the stream as well, joining this trail in about 1/8 of a mile. The trail head for all things up the Cold Spring drainage. Mileages under the falling paper sign are for destinations up the east fork trail and marked as meters, but they mean miles. This year's crop of poison oak looks to be very healthy. There are plenty of wildflowers out and by the trail junction just one quarter of a mile up, I'd passed great crops of sweet pea and coreopsis and honeysuckle. 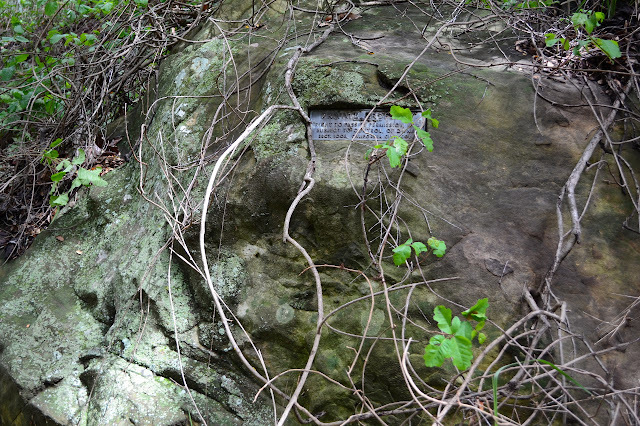 Next to the first of the old Private Property plaques in the rocks, the new detailed sign tells of both the west fork and east fork trails, but doesn't feel the need to mention the main fork. Next to the second one, the trail from the other side of the creek joins. The second of the plaques indicating this is private property and permission to pass is subject to control by the owner. Presumably these signs predate 1926 when much of the land was donated to the city. Just before a bench, a very solid torch cut sign marks the route up the west fork. This is the way to the waterfall, so I turned up it and crossed the stream. Pipes of rotten, ancient iron and fragile PVC follow along the side of the trail on this fork. Some of them head up to the City Tunnel, one of four tunnels in the drainage which are basically horizontal wells, that the rerouted west fork trail now passes next to. After the crossing, the trail climbs up to a few feet above the stream. It passes some nice rock formations. A few slides make footing slightly non-ideal, but are now old and well trod down now. This part does pass through private property along an easement. I found even more flowers along the way with hummingbird sage and some tiny white flowers. Along the way, there are a couple spots that allow viewing the waterfall, which was looking very nearly dry and I decided to head up above the falls instead. After about a mile, the unsigned main fork trail breaks off to the north and I dropped down it. Some little milkmaids by the side of the trail. A good view of the waterfall, somewhat obscured by a tree, along the West Fork Cold Spring trail.